Tangy and juicy, emerald green kiwi fruit gives a refreshing boost to fruit salad and to cool summer drinks. It looks colourful on pavlovas and cakes too. No need to peel – just halve and dig in with a spoon. As our kiwi is organic, if you don’t mind the texture, you can even eat the skin for added goodness. We source our kiwis from New Zealand whilst we wait for the European season to start. As with all our imported produce, we promise never to airfreight. Our kiwis are sold as class 2. This means that they might not look cosmetically perfect, but they are grown for the very best flavour. (We have to tell you this to satisfy some EU rules). 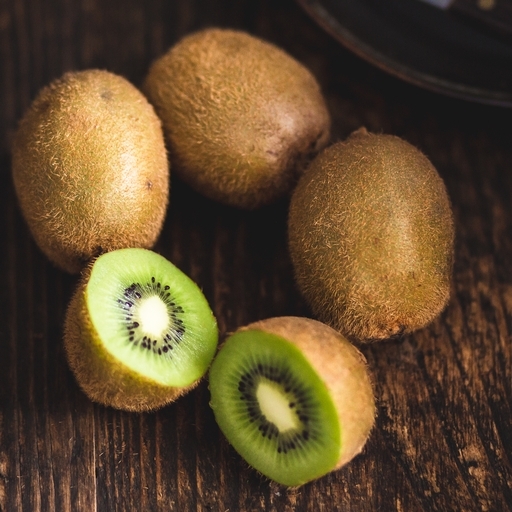 Kiwis are rich in the enzyme actinidin, which can cause an allergic reaction – most commonly to people who are allergic to latex, papayas or pineapples.